This brand new, advanced camera technology allows us to see deep into the layers of the skin. With the Observ 520 skin analysis, we can gain a greater understanding and evidence of underlying skin concerns. Not only can we take restorative action but also help to prevent further imperfections on the skin by utilising the right products and skin treatments. And it’s FREE! Book into your nearest The Cosmetic Clinic to get your free skin analysis. Select clinics only. Watch the video for more information and how each of the six modes work. 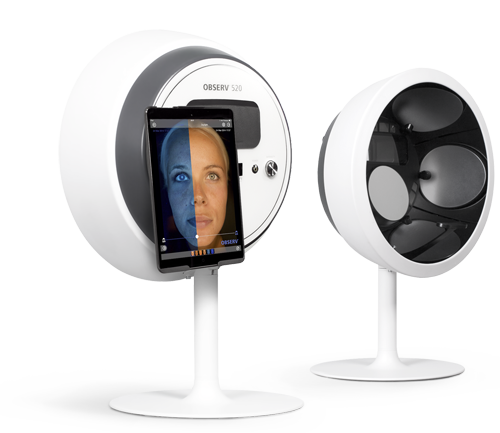 The Observ 520 takes six photographic images with different lights using an advanced camera. These varying lights provide insight into skin concerns and potential damage that is not noticeable to the naked eye. This is what the skin looks like in natural daylight environments. This is perfect for before and afters. Suppressing the skin’s surface shine, we can see the dermal structures, vascular conditions, inflammations and pigmentation residing beneath the other epidermis. This mode shows an enhanced view of the skin’s surface. This will show fine lines, micro relief, wrinkles, texture and pore size. Abnormalities on the surface or in the deeper layers create fluorescence patterns that stand out from surrounding healthy skin. We can also identify oily parts of the skin. This mode shows secretions and gives us a clear view of the amount of hydration and oil flow in the skin. It also shows loss of integrity within the skin tissue. The last mode reveals a look into the future of your skin if any damage or irregularities are not fixed. The results from your skin analysis will enable our expert Dermal Technicians to construct a customised and informed treatment plan. By comparing before and after images following your treatments, you will be able to track your progress and we can email these images to you. By using the right products and treatments, you will be able to prevent further imperfections and damage to your skin.